It’s official! Southern Beauty Magazine is now distributed across the country! What an exciting thing to watch. With a career in cosmetics (Estee Lauder), she found herself amazed at how the South led the market in cosmetic purchases. She realized that Southerners were buying the majority of cosmetics but weren’t represented. and now with almost 100,000 copies being distributed in grocery stores, drug stores, Barnes and Noble, Books A Million, she is taking the magazine market by storm. Shannon’s dream was to create something with a bit of Southern Charm, that was “cutting edge” as far as the products it offered, and also was something that was acceptable for the “living room coffee table”. The covers are clean, fresh and have so far featured Reese Whiterspoon, Nancy O’Dell,Jennifer Love Hewitt and LeAnn Rimes. Shannon wanted to feature a SOUL section in the magazine, with deeper articles, about inspiring women who did more than just “exist”. She wanted stories that dug deep…that encouraged women to live with the purpose that was placed in their souls. 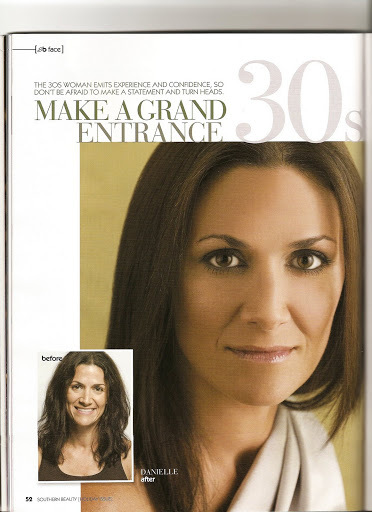 I got the privledge to do that task…to interview incredible women. I will share the background on some of these stories. To see them function, with home schooling, and two off at college or in the military, work force, is incredible. There is such order and love in that home. Beverly also now volunteers to counsel families considering adoption or any who have had their children taken from DHR…so she is using the love in her soul for children to see that none are left in the cracks. There are more than 200 children waiting to be adopted in Alabama alone and the statistics are that 1 in 4 children will be sexually abused or beaten. ONE IN FOUR. Because of this assignment I have built a lasting friendship with this incredible family. a place where God planted a love of writing in me..
and now He is letting me fulfill it…. 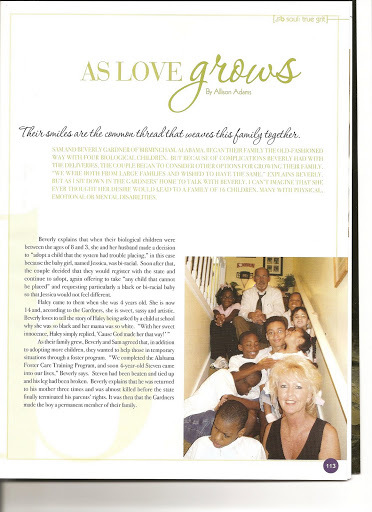 and the best part of it is..
but I was never led to actually adopt..
so this magazine fulfilled that “calling” and allowed me to share a great story about the success of adoption… more than 8 years after I began stirring on the subject. With each and every story, there has been a deeper story that began in my heart. Isn’t that every writer’s DREAM? To write about the things you KNOW you were born to write? And so each month, I am given assignments, and whether Shannon knows it or not, she is not only feeding a world with inspirational stories that inspire the soul by assigning them TO me, she is fulfilling a need in one Southern girl’s soul that was planted years ago WITHIN me. I look forward to sharing more of these with you in future blogs. Until then, get the current issue. MAYBE I CAN TELL YOU ABOUT IT SOON. Allison-My name is Kristin and I am the manager at Willis Gray Gallery in Decatur, Alabama. I came across your blog and was curious if you might be interested in hanging some of your work at our Gallery. I would love to speak to you further about this, my email address is Wgg04@pclnet.net and our phone is (256)355-7616. Thanks and I look forward to hearing from you!